London-based product development startup BERG introduced the Little Printer today, a new product that takes your digital news, puzzles and updates from friends and prints them out with a smile. It is definitely a step in the retro direction – the device prints those mini updates on what resembles cash register receipt paper. 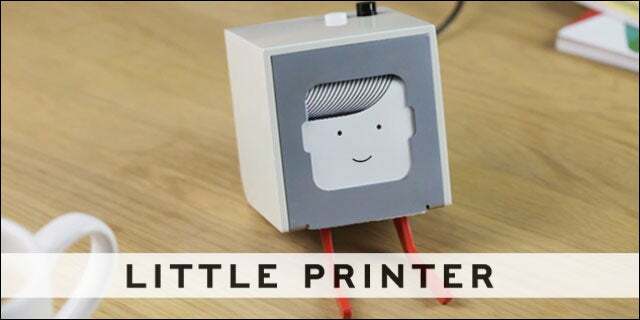 Little Printer is like having your own mini-printing press at the ready. Just use a mobile application on your iPhone or Android called BERG Cloud to set up the content options for Little Printer. You can subscribe to one of BERG Cloud’s “publications,” as well as daily puzzles, friends’ birthday reminders, headlines from your favorite news sources, to-do lists, Foursquare check-ins, a workout check-off list and more. I expect BERG to continue to improve and expand its offerings to include additional publications and digestible pieces of content. When you are ready to receive your content, you simply press a button on the top of the Little Printer, and your mini-newspaper prints. You can tuck it in your moleskin notebook and hit the road or sit down with a cup of joe or tea and consume it one sitting. The Little Printer also prints out a smiley face, which is kind of cute and brings a happy persona to the printer. This could bring a smile to your face and help you forget any frustrations that you have had with printers in the past (hopefully not as bad as the printer in the movie Office Space). The Little Printer is like a paper-based version of Chumby, the friendly content platform for flash-based apps. Pricing has not yet been announced, but BERG will be taking pre-orders in 2012. In the meantime, check out the demo video below.